1. Carefully cut the tofu into 8–9 slices and pat dry with kitchen towel. Tip the flour on to a plate and season well. Add the tofu slices and dust with the flour. 2. Heat the oil in a large non-stick frying pan and add the tofu slices. Fry for 2–3 minutes each side, until golden, then transfer to a plate and keep warm. 3. 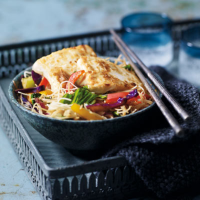 Add the Sichuan pepper and the mixed pepper stir fry pack to the pan and stir-fry for 1 minute, then add the noodles and stir-fry for 3 minutes. Stir in the soy sauce and rice wine and cook for another minute. Divide between 4 serving bowls or plates and top with the tofu slices. Serve straight away. Tofu is fragile and can be quite tricky to turn when cooking, so it helps if the pieces aren’t too long or wide. As an alternative flavour to your stir-fry, try using a pouch of one of our delicious fresh Stir Fry Sauces, such as Plum & Hoisin or Sweet Chilli.